The beginning - we have been working and preparing for this for what seems like years. 01/07/2003 - and so it begins! Well this is it, all the things that needed to be done in Sydney have been done. 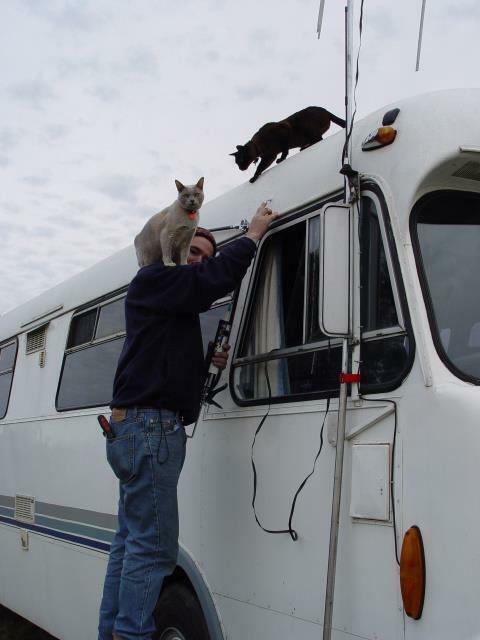 The motorhome is ready, the cats are ready and we are ready to go. It seems to have been so long now that we have been planning this and at last the day has arrived. Sadly, it is not a very pleasant day weather wise - but that is no where near enough to dampen our spirits. After a few dramas getting the Moke into the rear of the motorhome (requiring the reattachment of the exhaust system) we are ready to hit the road about 11am. A new month, a new financial year, and a new chapter of our lives. Just time for this photo of the storage yard that has been home to the motorhome for these last few months. After dropping off a few more boxes for storage at Wyong we found a parking spot for the night on the beach near Tourkley. At about 2am I awoke to hear movement coming from the kitchen area - at first I thought it was one of the cats looking for a midnight snack, but then I realised that they were both on the bed asleep. To cut a long story short, we caught this huge rat in the dive catch bag (the first attempt was with the rubbish bin - just for reference, rats can jump quite high!) and ejected him from the motorhome at about 4:30am. Where were our fearless rodent eradicating felines during all this? Sleeping!!! 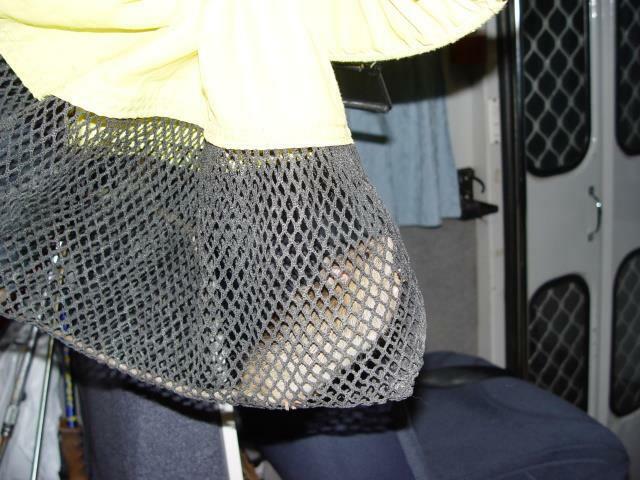 Oddly enough, the rat seemed to shrink incredibly just before this photo was taken - when he was running around the motorhome he was much much bigger. 10/07/2003 - No fish yet! After a days unsuccessful fishing near 'The Entrance' we headed inland hoping that it would be warmer. 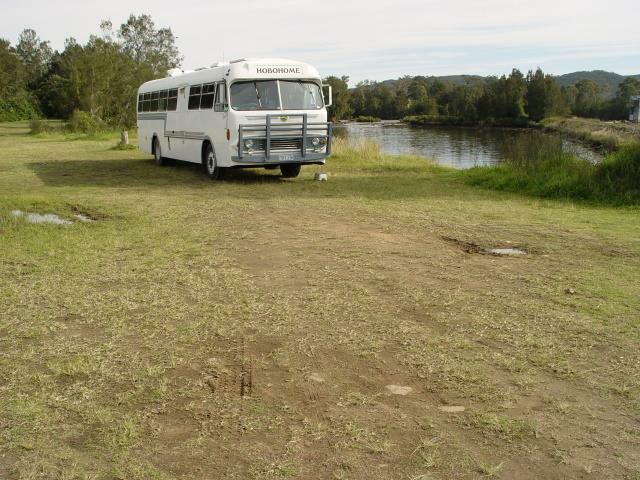 We found a very nice camping spot near a dam just north of Raymond Terrace. This turned out to be a great place to hide away and we decided to stay for a few days. This gave us the opportunity to relax and the cats an opportunity to re-learn about cat doors (this took less than an hour - much quicker than we expected). The down side to having a cat door that allows cats can come and go at will, is they now bring us all kinds of treasures - the count thus far... 1 bird, 1 mouse and 2 lizards. Fine weather meant we were able to complete all the small tasks around the motorhome but the nights were very cold with the over-night low touching just 3 degrees. Yesterday we decided to venture out to the coast and a little further north. We drove to Hawks Nest then through the Myall Lakes National Park to the ferry crossing at Bombah Point only to find that we were too big for the ferry. 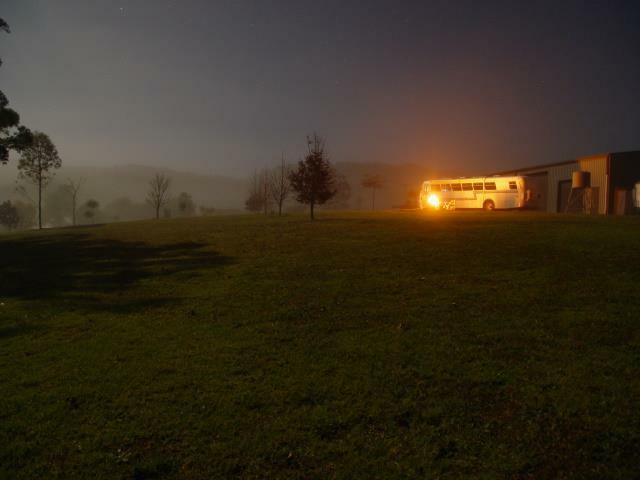 We had no choice but to drive back to Hawks Nest for the night. We found a nice place to try some more fishing, watch the magnificent sunset and to camp for the night. While Tracey tried fishing again, I went for a snorkel. I saw lots of fish (Tracey caught none) - I think a spear gun might be a good thing. After leaving Hawks Nest (fish-less despite buying a spear), we headed up the Pacific Highway making our way slowly north. While stopped in a rest stop for a coffee break we had a visit from Tom (who was driving a Winnebago and had also stopped for a break). Tom said that they were on their way to a weekend gathering of the CMCA chapter - the Manning Valley Wanderers - and that we were welcome to come along. We knew nothing about chapter gatherings, but after a quick discussion we decided to check it out. The Manning Valley Wanderers chapter gathering was in the State Forest near Coopernook - a very nice camp spot. The game Disc Bowls (that is really what it is called) seems to be a bit of an obsession with quite a few CMCA members. Ken demonstrates in this photo that the members of the Manning Valley Wanderers are no exception. A mower was produced to prepare the playing area! At this stage we were beginning to wonder about the sanity of the group. As it turned out, the entire chapter were lots of fun and very very friendly. We enjoyed a great weekend with some very nice people. We have decided that we will definitely check out other chapter gatherings and hope that they are all as friendly. 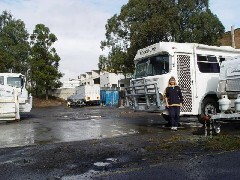 Ron and Aileen arrived at the camp on the Sunday and invited us to park the motorhome on their farm nearby. This seemed like a good opportunity to relax and see if we could sort out the root of the fridge problem. Ron and Aileen's farm turned out to be a wonderfully peaceful place with a fantastic view of rolling green hills and a dam full of fish. (which still manage to elude Tracey's lure) It will be hard to leave here! 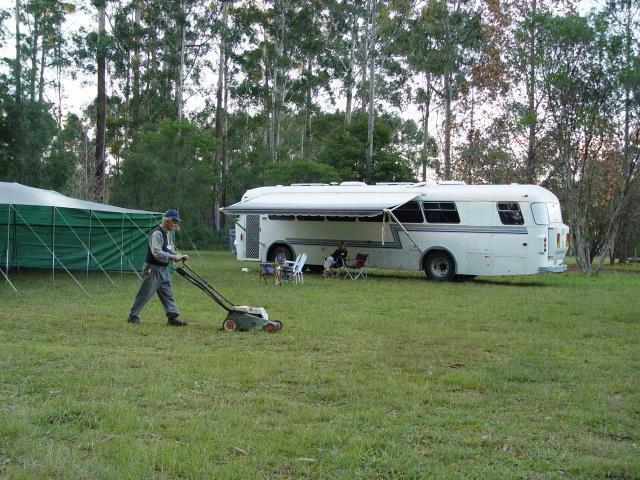 During the time we spent at Ron and Aileen's farm I managed to get lots of little jobs done around the motorhome. I also built a web site to help them show-case the motorhome they have for sale. From here we are going to have to get moving so we can get to the Gold Coast to meet up with Lee and Howard (my sister and brother-in-law). We made it! We arrived on the Gold Coast on the 25th after a slightly faster than normal trip. We treated my sister and brother-in-law to a trip in the Moke when we picked them up from the Brisbane airport (at 5:45am!). We spent Saturday evening at Tracey's brother's house and enjoyed watching the All Blacks take the Wallabies apart. We have sorted out a few good places to stop. However we were politely moved on from our top spot on the beach today. No worries - there are a thousand more.